We’ve been blessed to work with hundreds of wonderful clients over the years, and we’re happy to let them tell you what it’s like when you hire us to help buy or sell a house. Unlike many other local real estate agents, we’ve never offered any incentive — cash, prizes, etc. — to encourage our clients to say nice things about us. These are all real reviews and testimonials. (We also have a few video reviews & testimonials you can watch.) If you’d like to speak to one of our past clients in person, contact us and we’ll help you get in touch. Jan. 15, 2017 by Gariann G.
Cari has been great to work with as a family. She was very inclusive of us and our 4 children in working through the best way to sell our home quickly. We had an offer within a few days. Even when there were some extenuating circumstances, she communicated them quickly. She answered all of our questions and we are looking forward to working with her in the purchasing a new home. Aug. 16, 2016 by Melissa F.
Cari is very responsive, including while she was out of town on vacation. She was attentive to our needs and was able to quickly assess our wish list to find us a perfect home in a short amount of time. We made several trips to Richland some of them last minute but she fit us in to her already packed schedule. Much appreciated! July 11, 2013 by David B.
I’m the CFO of a real estate investment firm doing business across the State of Washington. We’ve worked with more real estate agents than I care to count and none have been more effective than Cari McGee. Cari knows her market very well and keeps us informed of developments in the market and with respect to our properties. Over the last few years she has diligently worked right through closing on all of the properties we have listed with her. 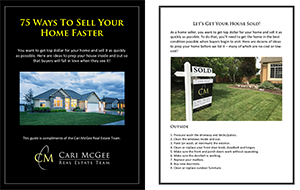 If you need a real estate agent in the Tri-Cities area you cannot do better than working with Cari McGee! Our move from Spokane to Richland was pleasant and efficient because of Cari McGee. Cari listened carefully to our likes, dislikes, and preferences and collected relevant information on every house we visited, enabling her to quickly narrow down the properties that she knew met our needs. Cari checked out dozens of houses before each of our visits from Spokane so that we could make the best use of our time. She also kept on top of new listings, alerting us almost immediately to what is now our new home — a house in the area we wanted, with all features we wanted, and within our price range. She is the reason we were able to make an offer on this house before others who were interested. Cari is delightful and very professional and made house hunting very positive for us. We highly recommend her as a top notch realtor to assist in finding a home or property. It was great working with you, you always kept me up to date and were proactive in your communications with me. I appreciate that and if it weren’t for the web site I would not have picked you first. Pamela and I are so happy with our decision to hire you to sell our Richland home. Your knowledge and steady approach to the process allowed me to rest easy. Thank you so much for all your hard work. Working with Cari on both buying and selling of our home was a wonderful experience. She is very knowledgeable, honest and dedicated. She has a positive attitude and she genuinely cares about her clients. She made the whole experience very easy for us and she was with us every step of the way. We appreciate her and all of her hard work. We would highly recommend her to anyone. My family had a parcel of undeveloped property in West Richland that we wanted to sell after holding it for 60+ years. I’ve never met Cari McGee and, as it turns out, never needed to. My internet research into Eastern Washington real estate agents led me to her name at every turn. A quick email and exchange of information was all it took to get the ball rolling. Next thing I knew I was looking at a beautiful piece of marketing material that really captured the essence of the property with both photos and a well written narrative. Cari estimated the time we should anticipate to turn this kind of property and hit it right on the head. While I may have expected this kind of professionalism I was delighted to see that she had gone above and beyond this standard and found she had visited the local planning commission and other official municipal offices to pin down details a potential buyer might ask. The next thing I knew, there was an offer and within weeks, a done deal. I spoke with Cari once about some paperwork and that was it until I called to thank her. The entire transaction took place with me never leaving my home and her doing all the legwork. What could be easier? If you’re looking for someone to ‘just take care of it’ then Cari is the agent for you. Trust me! Cari knew after our first day of looking at property exactly what we liked, and found for us the perfect property. We love our new home and can’t wait for Jerry to retire this year so that we can be there permanently! Thank you Cari for helping us to make the right decision for us. Cari McGee has been very enthusiastic and totally supportive throughout our long search for just that right home. As our realtor, Cari was right there with us from the very start to the finish. When one is around Cari for very long, you soon learn that, to her, being a realtor is not a job, it’s a passion. My husband and I were very pleased with the great advice and suggestions for getting our home sold quickly (10 days). Similar homes are still on the market months later. We wouldn’t hesitate to use Cari McGee again, and we recommend her to all our friends and to anyone who wants an expert for their real estate needs. Cari is a pleasure to work with. Her professionalism and always positive attitude make her a success in the real estate business. She made our recent purchase seamless and we both look forward to working together with her in the future. It was a wonderful experience working with Cari McGee on the building/purchase of our new home, especially since this was our first time to build under these circumstances. We appreciated her personal involvement working out the details as we made changes. She was always very prompt in getting back with us when we had questions or concerns. We would highly recommend her to anyone wanting to build or purchase a new home and would love to work with her again. Cari truly cared about us as clients and she became a good friend. When we called Cari she immediately wanted to know all the specifics about the type of home and areas in the Tri-Cities we were interested in and when we arrived she literally wore us out touring. She had all the information on schools, utilities, safest areas, traffic patterns, etc. If you want a top notch gal that will work tirelessly in your behalf and make sure all the I’s and T’s are crossed, Cari McGee is your gal! My husband and I moved from Oregon in late 2005. We had only one day to see as many houses as possible and hope that one was what we needed. When we arrived and met with Cari, she had a full list of about 15 houses to look at. We found the one that was what we were looking for. She helped us throughout the process, faxing paperwork back and forth between here and Oregon and provided a sounding board when things didn’t seem like they were going to work out. Luckily, they did and it was Cari’s professionalism and caring attitude that got us through. We truly felt like we were the only clients she had. We highly recommend her to anyone that is going through the buying or selling process.